Kangas, the colourful covers of the women of Zanzibar, take up art, beauty and tradition in the culture of Swahili. 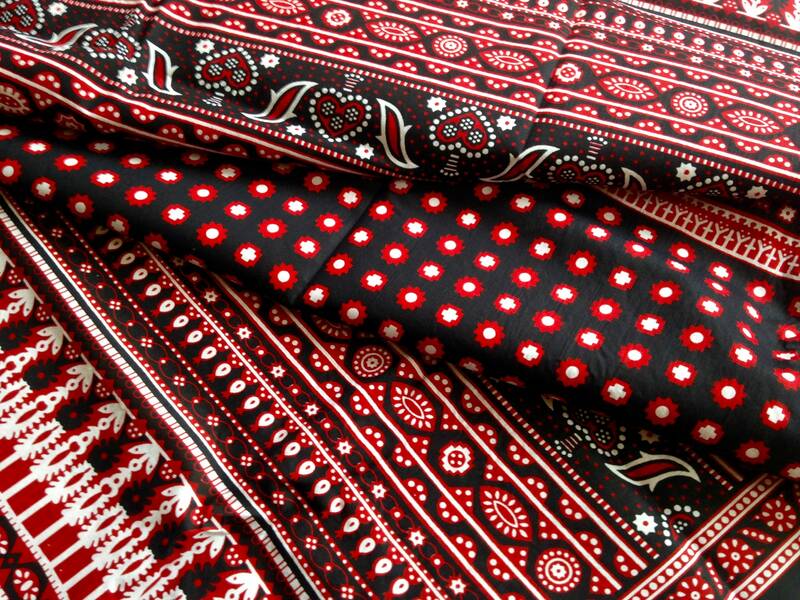 The Kanga is a very colourful printed cotton fabric. The Kanga is of different strength. Kanga "Nzito"-is called a somewhat firmer and "heavy" Kanga. They come directly from Tanzania and Zanzibar. The Kangas are always made in pairs. There is a fringe, a middle section and a saying. Sits of Kangas are common about relationships and feelings of love and envy, or allude to social, cultural and political problems. This Kanga has no saying!! It is worn to weddings in Zanzibar. The pattern repeats itself after half, so the fabric is also divisible. The pages are not cleaned up. I sell them both individually and as a couple. The fabric is made of pure cotton and it is slightly translucent. The pattern and the colours are equally recognizable and visible on both sides. Kangas can be used for clothing, table towels, wall hangings, carrier towels or beach towels. the fabric is beautiful! the owner is extremely kind and helpful! African fabric, wax print, cotton fabric patterned, Kitenge "Marumaru"
Wunderschön. Vielen lieben Dank. Sehr gerne wieder. Die Bestellung wird erst nach Vorkasse versandt. Keine Ausweisung der MWST, da Kleinunternehmer gem.§19 Abs.1 UStG. Der Versand erfolgt meist durch Deutsche Post AG.